Uprated front mounting intercooler for the VW T5 bus or van variants. 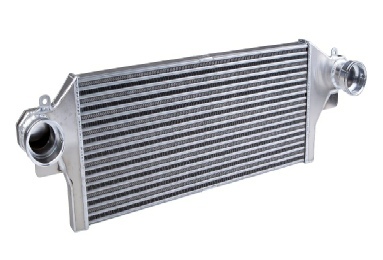 Although significantly larger than the original intercooler, this unit is a direct plug in replacement requiring no additional hoses or pipework. With a larger front cross sectional area, the cooling/power recovery is improved. The unit offers a lower resistance, compared to OEM without adding turbo lag. Fits the following engines: AXB, AXD, AXE, AXC, BRR, BRS, BNZ, BPC, BLU, CAAA, CAAB, CAAC, CAAD, CAAE, CCHA, CCHB. This will aslo fit the new 2010 onwards Vw T5.1 2.0TDI single turbo 140bhp, 114bhp, 102bhp, 84bhp models.